Don't let venison preparation stump you again this season. Here are some easy tips for preparing venison from field to table! Venison is one of the healthiest meats in the world. Deer are organic, free-ranging consumers of natural grasses, plants, berries and acorns – nature’s candy that is free from harmful antibiotics, hormones and pesticides. Meat from deer, moose and elk is lower in fat and cholesterol, and higher in vitamins and omega-3 fatty acids. But like anything worth having, it must be prepared properly from beginning to end if you want to savor the rich and healthy benefits it has to offer. Brian Tucker of Wyoming is the senior account executive for Hi Mountain Seasoning, and for nearly a decade he’s been slicing, dicing, seasoning and savoring wild game of every type. He prepares and processes between 30 and 40 big-game animals a year. According to Tucker, the first step to keeping your venison from tasting like it was run over by a semi is quality field care. This begins with the shot. We all make poor shots on occasion – it’s a reality of hunting – but a well-placed arrow or bullet and quick, clean kill is the way to go. The longer it takes a wounded deer to die, the more adrenaline and lactic acid builds up in its system. That can affect the flavor of the meat. Once a deer is down, Tucker believes it's important to remove the organs and entrails quickly. Once blood stops pumping the decomposition process begins, and internal bacteria goes to work. This process is accelerated in higher temperatures, so it’s vital to remove the organs and get the meat cooling immediately. Stuffing a block of ice inside the deer’s cavity is a good start, especially if you have to drive it to another location for processing. Skinning the carcass also is essential to the cooling process. A deer’s hide and fur are designed to keep it warm and help regulate its body temperature. As soon as Tucker has a chance, he skins the deer and hangs it in a walk-in cooler set between 38-40 degrees Fahrenheit. After skinning, Tucker removes as much of the gristle, fat and silver skin as possible. This cuts down on processing time and helps ensure tender meat. If a walk-in cooler is not available or you plan to process the deer yourself, quarter it and place the meat in an oversized cooler if outside temperatures are more than 40 degrees. Put a layer of ice in the bottom of the cooler, lay the deer quarters on top and add more ice. Open the drain plug, tilt the cooler, and let the melted ice and blood drain. Tucker insists on aging venison and considers it an important step in creating succulent, tender meat with good texture. He dry ages his venison by hanging it in a 38- to 40-degree cooler for about five days. This helps tenderize it. You can create a walk-in cooler by taking the shelves out of an old refrigerator and creating a rack in the top. This will allow your deer quarters to hang freely. You could also use an oversized cooler. However, Tucker recommends using this method for only a couple days because it does not allow the meat to properly vent. When processing your meat, look for where the muscles connect and membranes run to make your cuts. Following these natural lines will allow you to separate the cuts and pick the best ones for your meals. For example, a hindquarter has two primary roasts — the round and tip. 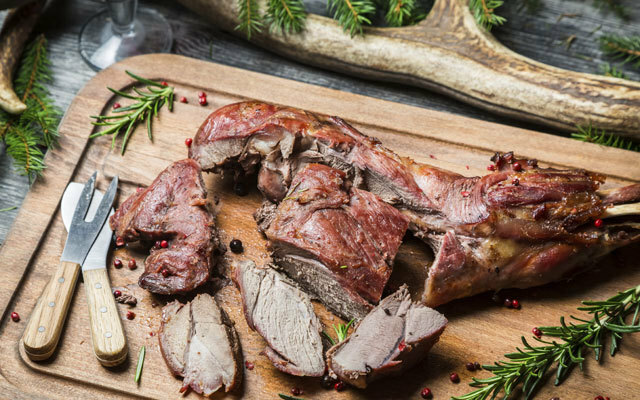 The round roast typically has less sinew, which makes it less tough and an ideal cut for venison steaks on the grill. By contrast, the tip roast tends to have more sinew, making it a tougher and better for a slow cooker or the grinder. Tucker emphasizes the need to trim as much sinew, membrane, fat and other connecting tissue as possible. These create tougher meat and can affect its flavor and texture. For making burger meat, he prefers a ratio of 80 percent venison and 20 percent beef fat. For a smokier flavor, he will do 80 percent venison, 10 percent beef fat and 10 percent bacon ends. Pork fat also is a good option when making burger or a breakfast sausage mix. Tucker believes the biggest mistake most people make is overcooking this rich source of protein. Many chefs and hunters believe venison is meant to be enjoyed rare and if done right, it’s like eating butter. Because of the lack of fat, venison cooks faster than beef. It only needs to reach a temperature of 130 degrees – get much higher and the meat begins to toughen. Using a dry rub, marinade or brine will not only tenderize your meat, but also will enhance its natural flavor. Venison stew with dumplings, stroganoff, and more favorites. Find dinner-party worthy Kentucky bourbon deer tenderloin, peppercorn steak, and more recipes. This article has been updated. Originally published November 2015. For more recipes about venison and other wild game, visit our Grand View Wild Eats page here and give them a try.